Last Friday, the ABC Daytime talk show, The View, featured the family of Mishell-Nicole DiAmonde Green. 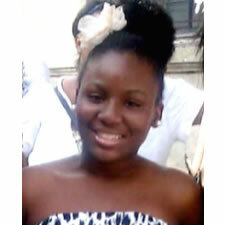 Mishell (pictured above) is a New York City teen who was missing for several months. The family, along with Derrica Wilson, president and CEO of the Black and Missing Foundation, were on the show to bring awareness to Mishell’s case and to discuss the lack of media attention given to other missing black teens. Fortunately, this story had a happy ending. A few minutes after the show aired, an anonymous caller gave Mishell’s location and added she was with a male and could be in danger. At this time, all the details of Mishell’s experience when she was missing are unknown. I wanted to share this story with you out there, because it’s so important for teen girls to keep safe. Little details have been released about Mishell’s ordeal, but it’s very possible the person she could have met the man she was found with online. There have been many cases in the last few years, where girls have met men posing as boys online. Some of these girls take the next step of meeting with the person face-to-face, which can sometimes have a tragic ending. Please be safe when using the internet. 1. Let someone know where you are at all times. You may feel like your parents are being overprotective, but if something happens, they will be able to let the police know where you were supposed to be at a certain time. 2. Don’t take a risk by meeting someone you meet online in-person. If you decide to anyway, make sure that you take a friend with you. 3. Don’t give out your address to someone you’ve just met. With Google Maps and other technology, it’s very easy for someone to find your exact location. 4. If you feel like a relationship with a boy or someone is getting dangerous, please tell your parents or other adult. They may be upset initially, but it’s better for you to be safe at home, instead of in dangerous situation out on the streets. ← Welcome to Double Dutch Magazine! Thanks for viewing the site, Rob! I’ve never had a MySpace, but I’ve heard quite a few stories that they are not very good at keienpg people’s names and info on private display, even after the person has requested it to be. Facebook isn’t exactly any safer if you don’t go through the precautions to only allow certain people to see your profile, but I prefer Facebook anyway because it’s cleaner, although with all these new add-ons they seem to be making it’s starting to get more obnoxious. But really, they can both be dangerous sites if you aren’t careful, but I think Facebook is just more organized.